Wash and cut the tomatoes into small pieces. Slit the green chilies and crush the ginger. Keep aside Heat oil in a pan, when hot add pancha phutan and bay leaf. When splutter add the silted green chilies and crushed ginger, fry till golden brown. Now add tomatoes, salt and turmeric powder. Stir properly and cover the pan with a lid for some time. Cook it for 2 mins. Add dates and freshly grated coconut. Add 1 cup of water to it .Cook it for 2 mins. In a separate tawa fry the cumin seeds slightly, when they start spluttering, remove from flame and make a fine powder out of it. Keep aside. When the tomatoes are cooked, add the powdered cumin seeds and sugar to it. Cook it for 2 to 3 min, remove from flame and garnish with coriander leaves. Serve with rice or puri. 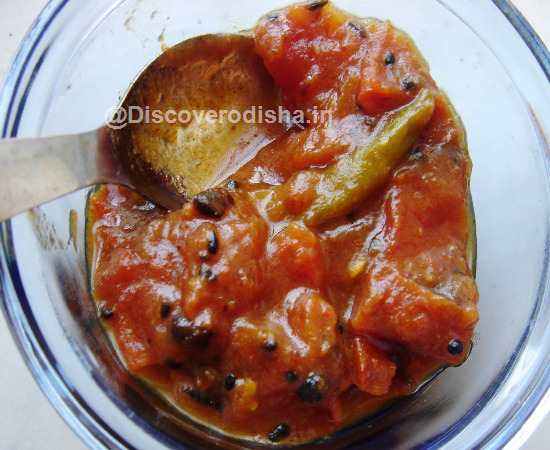 Tomato – 500gm Chinni (sugar) -75 gm Khajuri (dates)- 100gm Nadia kora (freshly grated coconut) -2 tablespoon Adaa (ginger) -1/2 inch Haladi gunda (turmeric powder) -1 teaspoon Kancha lanka ( green chili) -4 (as per taste) Teja patra (bay leaf) -2 pcs Jeera (cumin seed) -1 teaspoon Pancha phutan (cumin +mustard+ nigella+ fenugreek+ aniseed) – 1 teaspoon Refined oil – 2 tablespoon Dhaniya patra (coriander leaves) -25 gm Salt – as per taste.